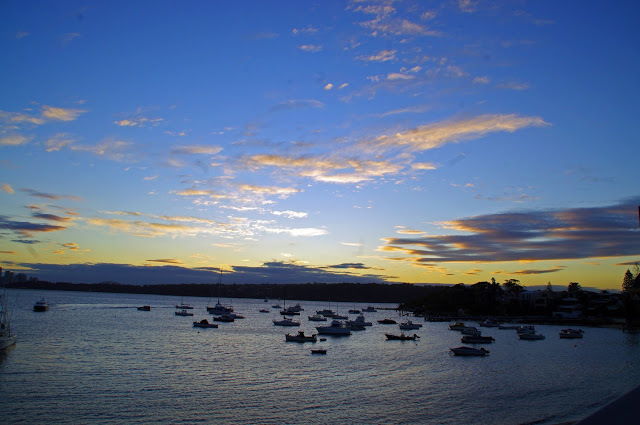 Watsons Bay Boutique Hotel and the Beach Club are an iconic part of Sydney Harbour. 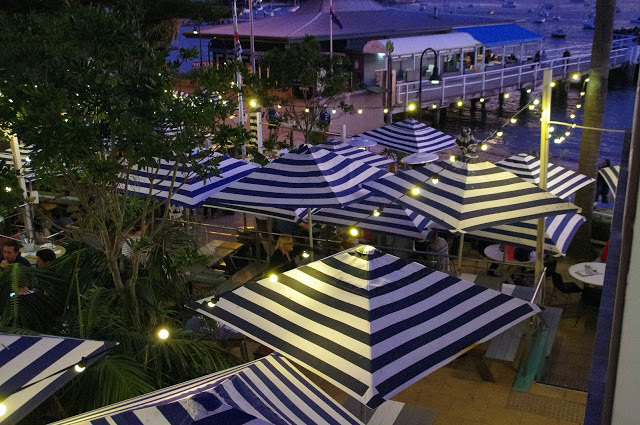 A gorgeous waterfront destination that is a popular hot spot for both wining and dining. 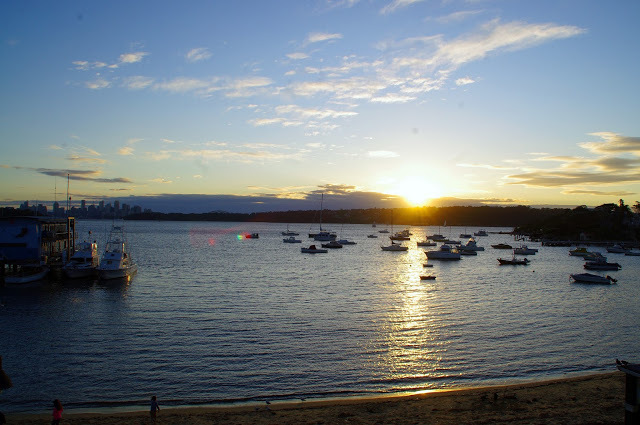 Their iconic, unrivaled waterfront location on the shores of Watsons Bay offers the most breathtaking views of the city skyline and harbour in a relaxed, beautiful location. 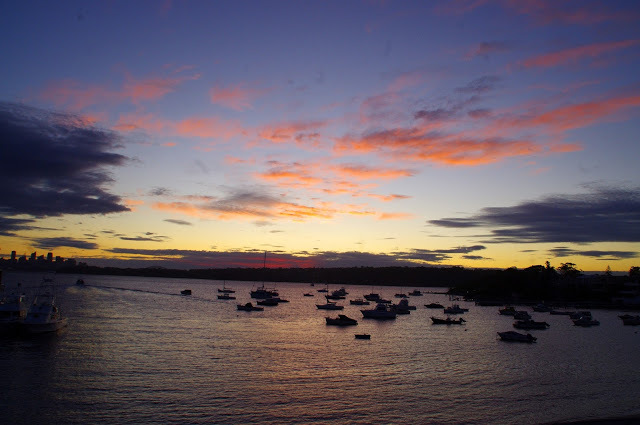 We were staying at Watson’s Bay Boutique Hotel on our first night in Australia, and couldn’t believe the beautiful location and views we had from the hotel. The Beach Club is located at the back of the hotel, overlooking the water. 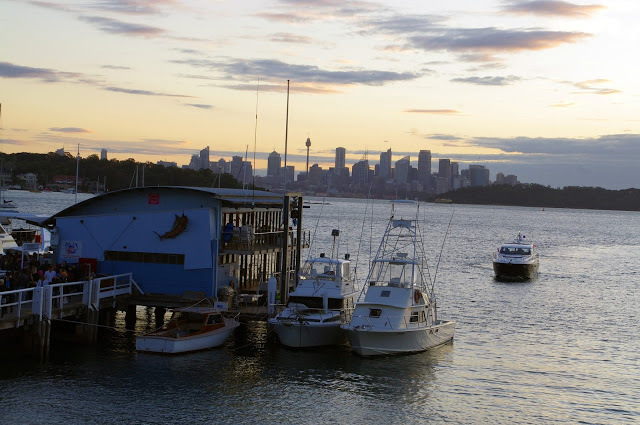 We couldn’t resist the waterfront location, breathtaking views and very short proximity to our hotel room (which was a important aspect given our jet lagged state)! 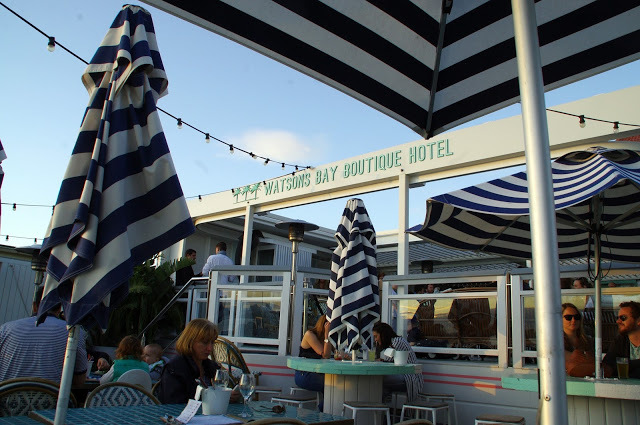 I loved the beachy, relaxed decor at the Beach Club. The perfect way to enjoy the breathaking views from the Beach Club are with one of their famous cocktails in hand! 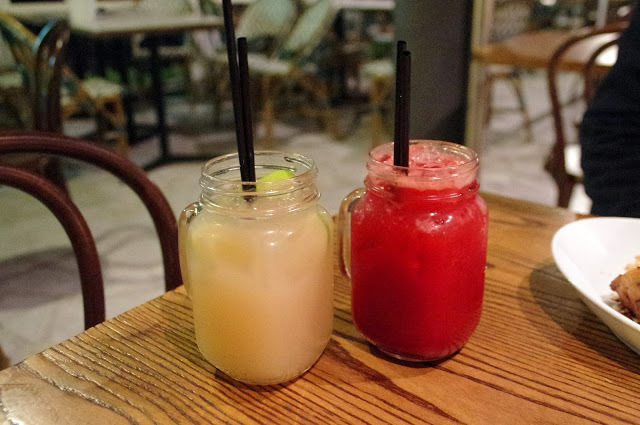 Dan opted for a Passionfruit Collins with Gordon’s Gin, fresh passionfruit pulp & lime, whilst I chose a Itsy Bitsy Bikini which comprised of smirnoff vodka, vermouth, lychee juice, apple juice and elderflower! Both were very sweet & enjoyable. 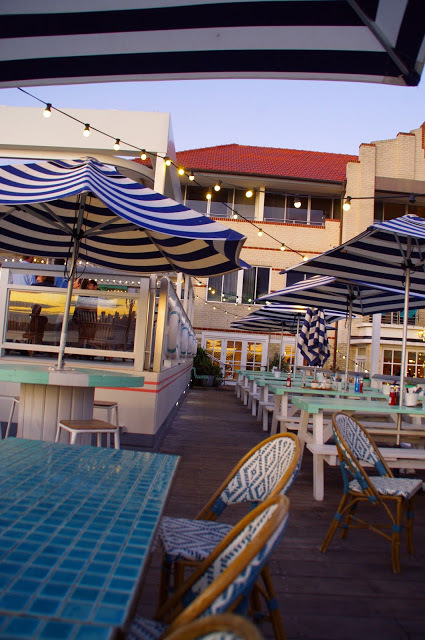 The Beach Club does have a very wide selection of of local and international wines, craft beers and delicious cocktails on order, which ensures there is a drink for everyone! 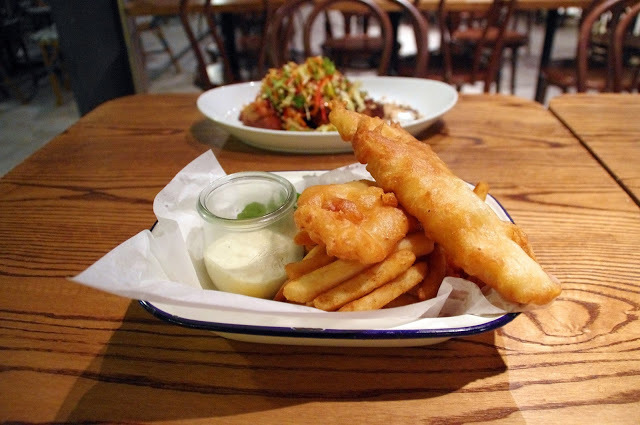 The menu has a strong focus on seafood and local, seasonal fare, and there are also some well priced specials on offer throughout the week. The atmosphere of the Beach Club is very social and relaxed. There is no standard table service and you order your food at the bar and are given a buzzer which lets you know when your food is ready to be collected. 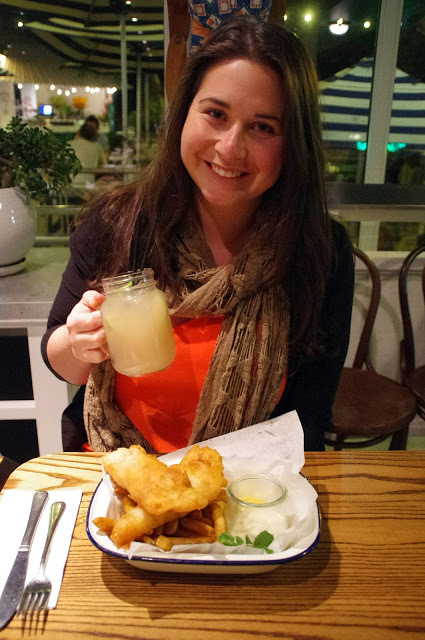 Being back home in Australia, I couldn’t help myself but go for an old favourite… fish & chips! 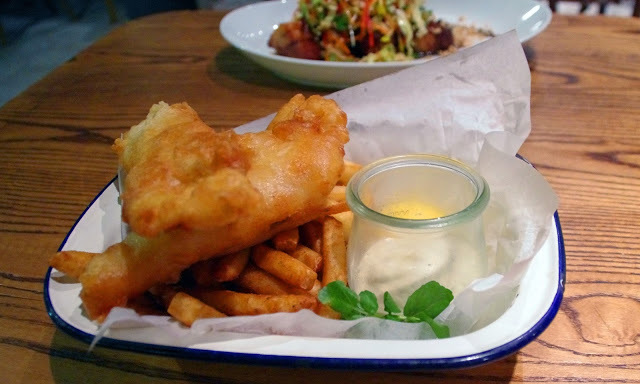 The fish was fresh and lightly battered and the chips were hot and freshly cooked. The meal was a good serving, presented well and served with tartar sauce. 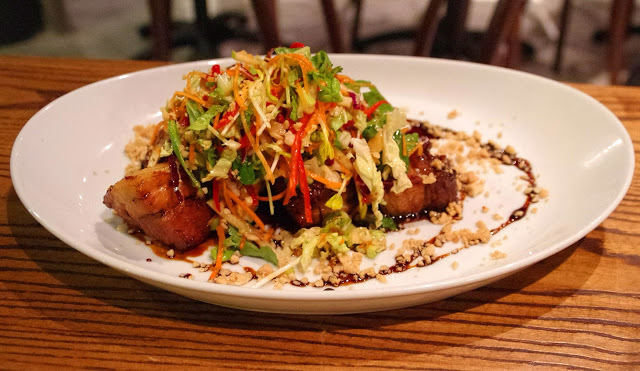 Dan being a huge lover of pork, went for the pork belly with Asian salad. The pork was cooked well and the salad, dressing and crushed nuts worked together well. The serving size was huge which Dan was very happy about, especially after a big day exploring Manly and Sydney Harbour. Our meals were ready in good time and were delicious, good quality pub food! Whilst we did have a great night at the Beach Club we do feel that the service was a little lacking. We had made a booking as it was a Sunday evening and when we first arrived we spent 10 minutes trying to get the attention of numerous staff members to find our reservation. When we finally found someone to assist us we were simply just told to find any available table. 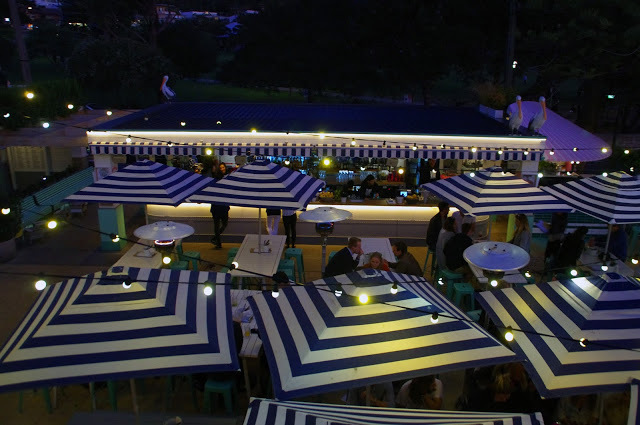 Throughout the night we found the staff to be fairly disinterested and unhelpful which is a shame given the incredible location and reviews we have read about the Beach Club. 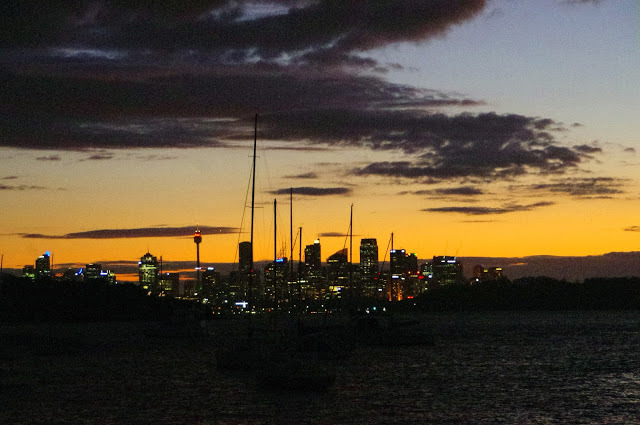 Our favourite part of the evening was watching the sunset over the city and harbour. 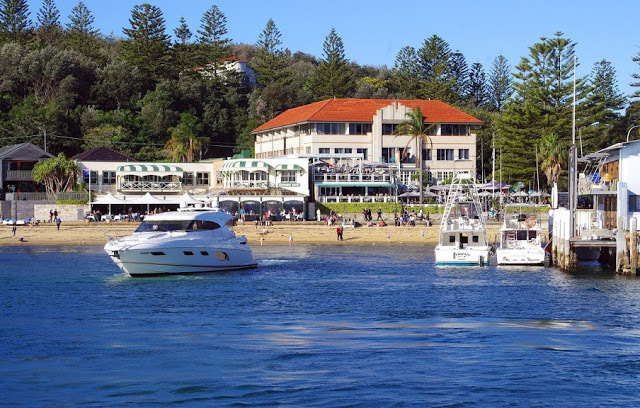 We did enjoy the relaxed atmosphere, dining and million dollar views from the Beach Club and would return simply for the views but we do hope that the service does improve a little before then as it was the only thing we found to be lacking. 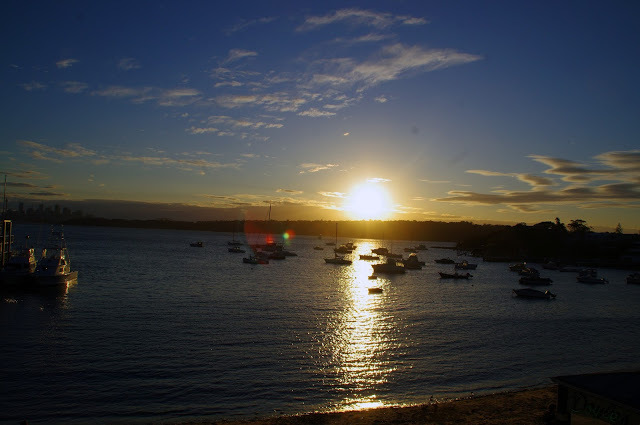 The Aussie Flashpacker was invited to review the Beach Club.